Laser pre-cut pre-fused kit. 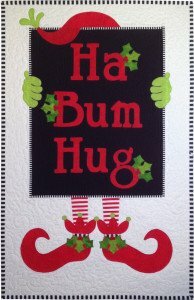 "Ha Bum Hug" says the happy little elf from behind it's sign as he buzzes around making holiday preparations. This cute and whimsical quilt will light up any room with it's delightful style.